Iceland is a small island nation of approximately 320,000 people located in the north Atlantic Ocean just below the Arctic Circle. The island is about 50% bigger than Tasmania. The island was first settled in the 9th Century and the population is largely descended from Celtic and Viking seafarers. The Icelandic language is derived from the old Norse language and quite different to other Scandinavian languages. Most Icelandic people also speak excellent English. The economy is largely based on fishing, farming and tourism. The capital, Reykjavik is a little larger than Hobart. 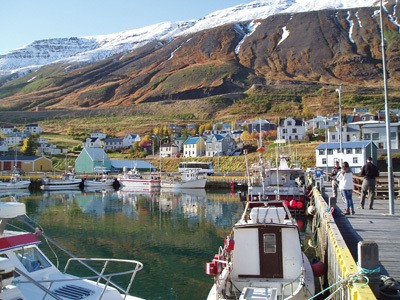 The second city of Akureyri (a little smaller than Burnie) is the administrative centre of northern Iceland. There are many small coastal communities, with the centre of the island being largely an uninhabited area of huge lava and ice fields. Geologically, Iceland is a very young country at the junction of the North American and Eurasian tectonic plates. As a result, seismic activity, active volcanoes and geothermal activity is common. It is a stunningly beautiful environment. The standard of living is high and the health system and the practice of medicine is similar to that in Australia. Iceland has a National Insurance Scheme somewhat similar to Medicare. This provides free hospital care and covers most of the costs for services in primary care and other outpatient or community services. There are no private hospitals in Iceland. The National University Hospital in Reykjavik is the only tertiary hospital in the country. Patients requiring more complex services not available in Iceland may have to travel to the UK, Canada or other Scandinavian countries. Interestingly, Iceland receives patients from eastern Greenland as services are very limited on that vast island and Iceland is the closest accessible tertiary care. Like Australia, patients from rural and remote towns often have long and difficult travel for specialist medical care and consultations due to the extremes of climate and geographical isolation. While there is an excellent national network of Primary care services, there has been a trend to reduction of obstetric and procedural medical services in the small rural hospitals which influences the sustainability of those remote communities. The University of Iceland has a small medical school graduating 48 doctors per year. It is a six-year direct entry course with a curriculum similar to Australian medical schools. Clinical experience is obtained in the tertiary hospital in Reykjavik, regional and district hospitals and primary health centres. Iceland is largely self-sufficient in medical practitioners with relatively few (compared with Australia) overseas trained doctors. While many health professionals travel to other countries for postgraduate education and training, there is a strong allegiance to their island homeland and returning to family and "home" is common practice. Following sequential visits by UTAS School of Medicine academics Assoc Prof Peter Arvier, Prof James Vickers, and Assoc Prof Kim Rooney, there is now an agreement with University of Iceland for exchange of medical students undertaking compulsory elective attachments in the final years of their undergraduate courses. The first UTAS students will travel to Iceland this (southern hemisphere) summer which will be mid-winter in Iceland. The first cohort of Icelandic students will travel to Tasmania in January-February 2014. Discussions have also been held in relation to collaborative research in areas of mutual interest, particularly in areas where a relatively genetically stable population gives scope to longitudinal studies of ageing and chronic disease. For further advice about electives in Iceland, please contact Assoc Prof Peter Arvier at the Rural Clinical School by email: P.Arvier@utas.edu.au.